At Moreno & Young Dental, we work hard to help patients keep their smiles whole and healthy, but when tooth loss occurs, we are here to help. We offer a wide range of restorative dentistry services to fully renew the lost form and function of your smile when you’re missing one or more teeth. If you’ve experienced tooth decay or dental trauma, call our Bellingham dentistry office right away. We’ll evaluate your smile and find the right solution to repair the damage and renew your smile. Two of the most commonly used dental restorations are dental crowns and fixed bridges. These reliable restorative dentistry options have offered effective smile restoration for decades. Today, we can incorporate these restorations into a plan, using dental implants to support a single tooth crown or multiple consecutive tooth fixed bridge replacement. A dental implant is a post crafted from titanium. It is inserted into the gum line where it mimics the function of the lost tooth roots. Dental implants can be used to replace any number of missing teeth from a single tooth to a full arch. For patients missing a single tooth or a few teeth in a row, an implant retained dental crown or fixed bridge may be the best option. Dental crowns are used to repair a damaged or decayed tooth. These restorations are crafted from a wide array of materials, including gold, porcelain fused to metal, and ceramic. They are formed to fit over the top of a damaged tooth to protect the remaining healthy structure. They can also be attached to a single implant post in order to replace one missing tooth. When do I Need a Fixed Bridge? Fixed bridges are advanced restorations used to replace one or more consecutive missing teeth. A dental crown is placed on both sides of one or more replacement teeth. Then, the crowns are fused to healthy teeth on either side of the gap left by the missing tooth, recreating the lost dental structure and restoring the smile. For patients with two or more consecutive missing teeth, dental implant supported fixed bridges offer an effective restoration option. How are Implant Crowns & Bridges Placed? Implant supported dental crowns and fixed bridges are placed over the course of three or more appointments. During the initial visit, we will need to place your dental implant or implants. We’ll make a small incision in the gum line. Then, the implant post is inserted into the soft tissue to the jawbone. Over the course of three to six weeks, the implant fuses with the soft tissue and bone. Once the implant has fully fused with the supportive tissue, you’ll return to our office, so we can design your dental crown or bridge. We place an abutment post that attaches the implant to the restoration. Next, we capture bite impressions that will be used by our lab to craft a custom dental restoration. Before you leave, we place a temporary crown or bridge. Once we receive the custom crown or bridge, you’ll return to our office to exchange your temporary for the custom restoration. Do I Need to Change My Dental Care Routine? 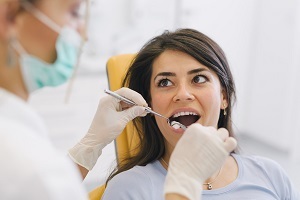 You will not likely need to make any changes to your oral health care routine. You may need to switch to a softer bristled toothbrush or less abrasive toothpaste. Otherwise, you can continue to brush two times a day. We may also recommend a waxed floss, water flosser, or other specialized flosser to clean around a restoration without pulling on the crown or bridge. During regular dental checkups and cleanings in our office, we will assess your restoration and make repairs as necessary to ensure your crown or bridge remains fully functional.